OCSCD’s Jersey-Friendly Garden Wins “2018 Garden of Distinction” Award! 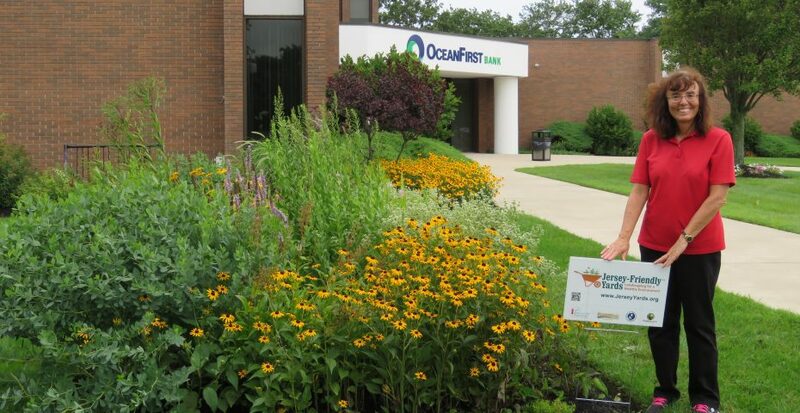 Through a grant funded by the Barnegat Bay Partnership, Ocean County Soil Conservation District installed a Jersey-Friendly Garden at the OceanFirst Bank Hooper Avenue Administrative Office, which was honored with a “2018 Garden of Distrinction” award by the prestigious Pennsylvania Horticulture Society. The Jersey-Friendly garden includes native and “Jersey-Friendly” non-native plants that are drought-tolerant, require low-to-no maintenance, and support native birds, butterflies, bees and beneficial insects. Read about our 22 Jersey-Friendly gardens installed throughout Ocean County. Learn how you can create your own Jersey-Friendly garden through the Jersey-Friendly Yards website, designed with home gardeners in mind! The Ocean County Soil Conservation District sponsored the 2016 Northeast Regional NACD Conference. Participants from around the northeast spent a few days in the Garden State exploring the diverse conservation opportunities in the agricultural, coastal, natural (Pinelands), and urban environments found throughout New Jersey and the northeast. Click here for more information. The Ocean County Soil Conservation District is featured in the summer 2015 edition of The Resource… Connect to the full newsletter on the NACD (National Association of Conservation Districts) website. Visit the Asbury Park Press for an informative article on Ocean County U Pick Farms.